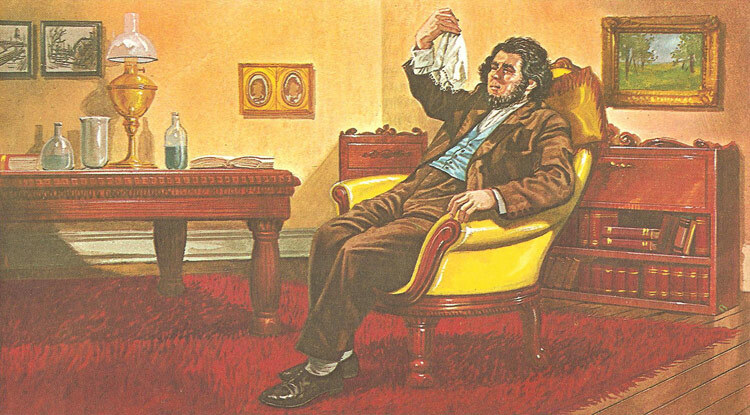 Simpson about to inhale chloroform from a cloth, demonstrating its powerful anesthetic effects. 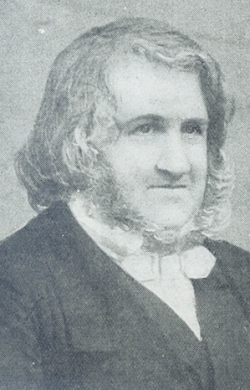 James Simpson was a Scottish obstetrician who pioneered the use of chloroform as an anesthetic (see anesthesia), especially for mothers during childbirth. Simpson was born at Bathgate, West Lothian, a baker's son, the youngest of eight. At an early age he showed an exceptional ability for medical observation and research, entering the University of Edinburgh aged only 14 and quickly attracting the attention of his teachers there. He took his M.D. in 1832, his thesis of Death from Inflammation being highly praised; and in 1835 was elected president of the Royal Medical Society. In 1840 he was appointed Chair of Midwifery at Edinburgh. In the 1840s many scientists in various parts of the world were becoming interested in the use of anesthetics. As far back as 1799 the English chemist and physicist Humphry Davy had noted that nitrous oxide seem capable of destroying pain. About 1844 Horace Wells, an American dentist, used this anesthetic for the extraction of teeth. Also around this time Crawford Long, William Morton, and other Americans were using diethyl ether for dental work. As news of this work came to Britain, ether came to be used for surgical operations. The first major operation in Britain under ether was conducted by Robert Liston at University College Hospital, London, in December 1846. In 1831 a substance was produced by various chemists (Guthrie, Soubeiran and Liebig), which came to be called chloroform. It was brought to the attention of Simpson, who, although he had previously tried ether, had thought it generally unsuitable for use in midwifery. Chloroform, however proved much more promising. Late in 1847 Simpson carried out an experiment with his friends, trying the effects of the anesthetic by inhaling it. The result was that they were soon all lying unconscious around the room. About the 15th of November 1847 he administered chloroform for a surgical operation. In the years that followed he frequently used chloroform to reduce the pain during childbirth. At first there was criticism of using anesthetics for midwifery, but the techniques gained official recognition in 1853 when John Snow administered chloroform to Queen Victoria during the birth of Prince Leopold. Simpson was a man of wide interests, both inside and outside his chosen profession. He made many innovations in the practice of midwifery, though, rather surprisingly, he attacked the practice of using antiseptics as put forward by Joseph Lister. After his death, his chief monument was the Simpson Maternity Hospital, later part of the Edinburgh Royal Infirmary.